Steven Spielberg delivers the definitive World War Two film. Through the simple story of the search for a lowly private in the immediate aftermath of the D-Day Normandy invasion, Saving Private Ryan encapsulates the scope of a global conflict, and defines the destiny of the post-war years. On D-Day, battle veteran Captain John Miller (Tom Hanks) leads his group of Army Rangers as part of the first wave landing on Omaha Beach. 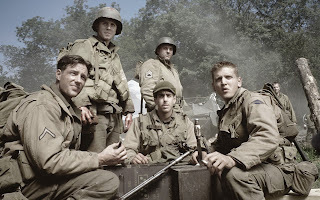 Miller's troops include Sergeant Horvath (Tom Sizemore), Private Rieben (Edward Burns), Private Caparzo (Vin Diesel), sharpshooter Private Jackson (Barry Pepper), the proudly Jewish Private Mellish (Adam Goldberg) and the medic Wade (Giovanni Ribisi). After a long, brutal, and gory battle on the dunes of Omaha beach in which many Allied troops are slaughtered, Miller and his men overcome stiff German defences and help to establish a secure beachhead. The many battles and many lost men start to take their toll on Miller: his right hand develops an intermittent, uncontrollable tremor. In the following days, the American military command learns that three brothers from the Ryan family have been killed in recent combat action. General George Marshall orders that the fourth brother, Private James Francis Ryan of the 101st Airborne, be found, extracted from the war and flown back home to safety. 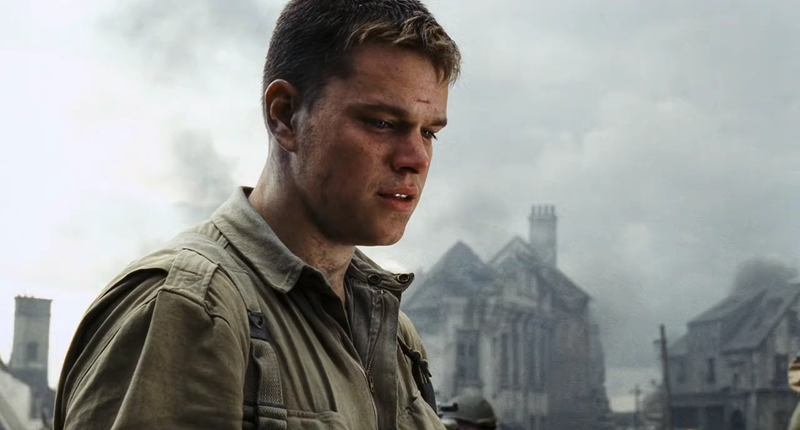 Miller and his unit are tasked with finding Private Ryan, although the 101st is scattered all over the French countryside behind German lines, and no one knows where Ryan is. Miller adds the multilingual but barely trained cartographer Timothy Upham (Jeremy Davies) to his unit, and the eight men head out on a dangerous mission to find one man among thousands of soldiers. The search takes Miller through an active war zone, as the disorganized but determined most forward Allied units try to hold on and fortify inland gains before German reinforcements arrive. Miller encounters Sergeant Hill (Paul Giamatti) and his men embroiled in a close-quarters pitched battle in the middle of destroyed town, then gets assistance from Captain Hamill (Ted Danson). A countryside detour to destroy a German radar installation causes extreme tension within Miller's small group, as losses mount and the surviving men, particularly Rieben, openly question the purpose of the mission and Miller's leadership.Finally, Ryan (Matt Damon) is located, having joined a ragtag collection of paratroopers, digging in to protect a strategically vital bridge in the town of Ramelle. With German tank units moving in, Miller informs Ryan that his involvement in the war is over, but Ryan has other ideas. 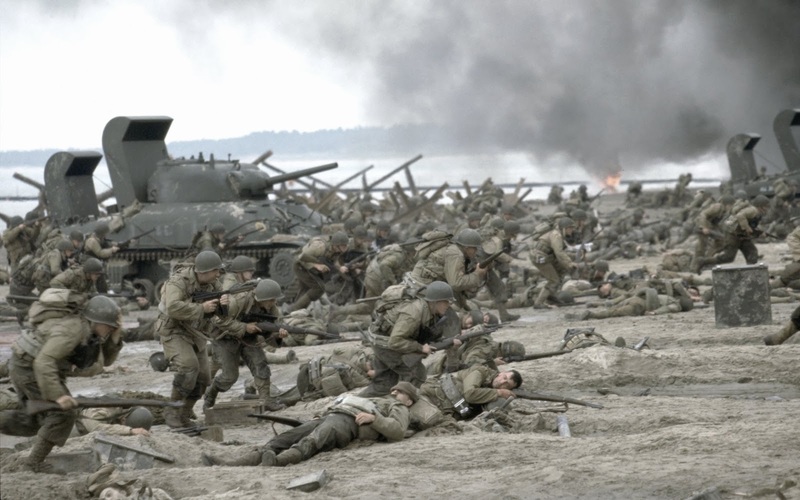 The opening 27 minutes of Saving Private Ryan, featuring the landings and battle at Omaha beach, are legendary. Possibly the most realistic and painful depiction of warfare ever filmed, Spielberg recreates a literal bloodbath, as Allied soldiers are slaughtered by German heavy machine gun fire on the open beaches, and yet the sheer numbers of the invaders and their determination eventually turn the tide of battle. Spielberg's cameras take a ground-level, soldier's eye view, dodging bullets and explosions, moving within the chaos, the smoke, the death and the dismemberment as confusion reigns, bodies pile up, the water turns red and the future of the war hangs in the balance. The depiction of the battle is full of gore, misery, cowardice, heroism and the atrocities of war, a soul-shaking experience rarely equalled in the history of film. Even within the chaos of the opening battle, Spielberg demonstrates genius in introducing several of the major characters and their key attributes. Miller, with his shaky hand and vulnerability for shell-shock, is nevertheless an effective leader, keeping calm, rallying his men and formulating the plan necessary to punch through the German lines. Horvath is his loyal second in command, and Jackson is the deeply religious sharpshooter, whose skills are frequently essential. By the time the beach battle ends, Miller is an established presence, gathering Normandy sand in a small canister to add to too many other canisters holding earth from too many other recent battles. It's a lot to ask for any film to maintain the momentum of that opening, but Spielberg pulls it off by zooming in. The rest of the movie is about the actions of individual men, not the movements of a massive army, and Saving Private Ryan transitions from the domain of liberating a continent to the story of saving one man. And with Spielberg having demonstrated no fear of portraying shocking and sudden death on the beaches, the threat of sudden demise lurks around every corner of the French countryside as Miller and his men make their way cautiously inland. And consistent with the realism established early in the movie, death proves to be a constant companion. 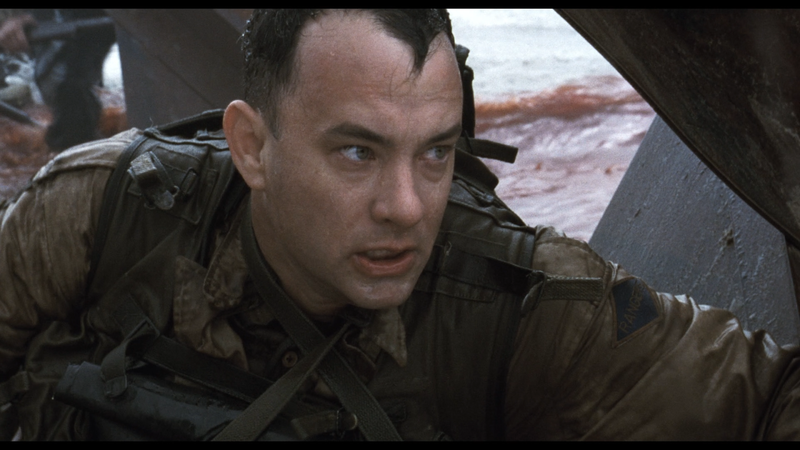 Saving Private Ryan forces heroism and sacrifice to walk hand in hand in a prolonged, agonizing courtship. Doubts about why eight men should risk their lives to save one private eat away at Miller's soldiers. When thousands of men are dying daily, what is the life of one private worth? Through the course of the 170 minute running length, Spielberg and writer Robert Rodat reveal their answer in subtle hints, as personal actions gain prominence, seemingly small choices have compounded outcomes, and a single soldier's decision carries far-reaching implications. The mission may have been about saving one man, but within that inordinately high valuation of the individual lies the purpose of the war, and the destiny of the post-war years. Cinematographer Janusz Kamiński used relatively washed-out, almost sepia-toned colours to give Saving Private Ryan a more historic feel, and the film is widely admired for the attention to detail and historical authenticity in portraying the uniforms, equipment, weapons and armaments of the day. And from within the realms of unfolding history, Tom Hanks gives the war its human face. Captain Miller is a civilian pressed into service, his pre-war career a closely held secret from his men. He does the best that he can, but this is not a blood-thirsty soldier living for war. Rather, the war has interrupted his living, and he longs to finish each successive mission as a another stepping stone on the long journey to return to his wife. Both deeply melancholy and fabulously inspirational, Saving Private Ryan questions the cost of war by celebrating the courage of the men forced to fight, and die, in battles large and small.